Once the big day has arrived, one normally doesn’t need any more surprises or adjustments to be done since there is enough pressure as it is in making sure that the day is a stress free event as possible for everyone. Hence, you may end up wanting to try a different approach than the traditional sit down menu and try out something different. Mexican food has proven to be quite exquisite and enjoyable for most people and this may offer a different flair with regard to you having a different and much more cost effective method of feeding everyone of your wedding party guests. Listed below are some reason that one should take into consideration when considering a Mexican catering service as their wedding catering option. Given the fact that it’s not the normal type of food that people are used to, offering a Mexican Taco Bar give the wedding a fun and different flare as the flavors are able to satisfy your guests. I mean who doesn’t enjoy tacos, fajitas among many other Mexican recipes we offer. It’s your big day and if you want tacos then make it tacos! Your guests that are enjoying the big day love tacos too, believe us! Why not have some fun at your wedding dinner? Did We Mention It’s Cool? 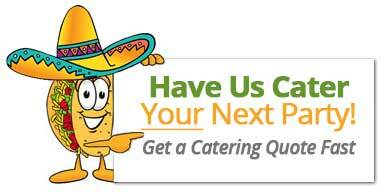 Mexican food comes in a wide variety and our wedding catering menu is customizable. You can offer a Fajita bar, a taco bar, a nacho station, a salsa bar, or really get creative with it and challenge us with something that we haven’t done before. The sky is the limit and your mexican themed wedding dinner is just waiting for us to bring our unique flair to the occasion. We’re known for wedding catering in Sacramento. Many of our customers hire a wedding catering service such as Sac Tacos because our service handles everything in regards to food and since we are able to provide delicious authentic food at a very affordable rate. Our taco catering service is second to none in Sacramento and we have a super high Yelp rating to prove it. Hence, you’ll end up saving your money and using the savings on something else such as more flowers, a nicer limo, or a better venue. The catering will be the least stressful part of the equation. When it comes to Mexican food, you don’t need not worry too much since it is normally known to be very healthy, low on calories and extremely satisfying as the delicious flavors are guaranteed to please practically everyone. Even for individuals who have various dietary restrictions, let us know and we can prepare a vegetarian substitute for many items on the menu. Just ask and we’ll try to accommodate for customers or guests with dietary restrictions. Get a Wedding Catering Quote Now!